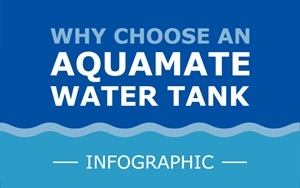 When it comes to water tanks, the team at Aquamate know what they’re talking about, because they’ve had years of experience to work it all out. They started their operations in the 1980s repairing leaking concrete tanks, and they’ve learnt a thing or two about what works and what doesn’t. Back then, a lot of the repairs were due to natural ground movement, poor workmanship and inferior or incorrect materials. The experience the Aquamate guys gained would prove to be invaluable when it came time to producing their designs. Aquamate water tanks are built to last, and this is because they are made with galvanised steel around the outside, which will not corrode. The galvanised steel Aquamate uses has three times the coating compared to Zincalume® steel, which means the material lasts much longer. While some may claim that Zincalume® steel does not corrode, this is simply not true. Under the right set of circumstances – for example when a tank is full – the pressure can cause the liner to rest against the shell, and condensation occurs. This is an occasion where Zincalume® steel can become corroded. When given the room to breathe, Zincalume® steel outperforms galvanised steel, and that is why the folks at Aquamate use it to clad the roof of their water tanks. Aquamate tanks use a monofilament polyolefin liner, which is highly flexible and is approved for use in drinking water tanks. Aquamate’s monofilament liners can stretch up to 700 per cent before breaking. This allows the liner to mould itself to the contours of the ground, the walls and even small details like the head of the bolts that hold the tank together. Aquamate does not use a liner that is prone to fatigue fracturing. Aquamate’s monofilament liner has a high fatigue resistance, which means your tank will last a lot longer than other poly-lined steel tanks. Plus, Aquamate tanks look amazing because they can supply a wide variety of colours. Represented Australia wide, Aquamate is ideally positioned to service projects across Australia. Zero Leaks is the philosophy Aquamate stands by, going hand-in-hand with its Zero Harm workplace and Zero Waste environmental strategy. A promise to customers to deliver fast, efficient and friendly service goes hand-in-hand with a 20-year no leaks warranty. For more information on obtaining an Aquamate water tank, reach out to us today.